*Anadromous [uh-nad-ruh-muhs]: is said of fish that live in the ocean mostly, and breed in fresh water, as salmon of the genera Salmo and Oncorhyncus. Trout and salmon species compose the vast majority of anadromous fish. They achieve a phenomenal feat in being born in freshwater, modify their body in order to adapt to salt water (process called smoltification), move out into the sea where they get fat, and instinctively migrate back to their natal stream in order to reproduce. I find that process fascinating. They endure a long travel from the sea, leap over cascades and fight predators. 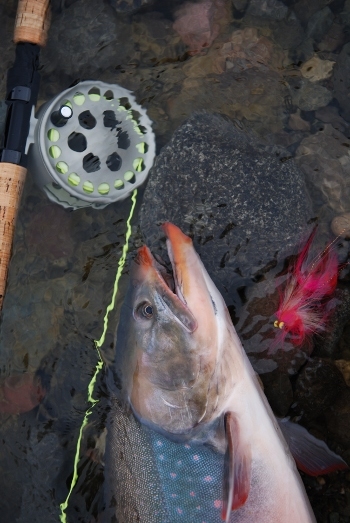 Moreover, the fish takes on majestic colors when they approach the spawning redds, making it even more spectacular. I have long been fascinated by these fish. I like to fish rivers, where they swim. Often they are in remote places, far away from civilisation. I like to contemplate these cold-blooded animals in their parring outfit. I like to swing my Spey rod and gracefully cast my fly across the current. Even though I also appreciate fishing for resident fish, them being in fresh or salt water, my fishing heart has always been closer to my anadromous friends. Hence, I thought this web site should be named after them.